Fusion. An excuse to take away authenticity on one side, and up the price on the other. This is what I used to think. To be honest, I disliked fusion anything. Mix martial arts and aerobics – get the former with no technique and the latter with less of a workout. Mix dance styles – lose the form in both. And mixing food styles, well, that would always end in disaster. But take a delicious Vietnamese meal, mix it with French wines, and now you are talking! 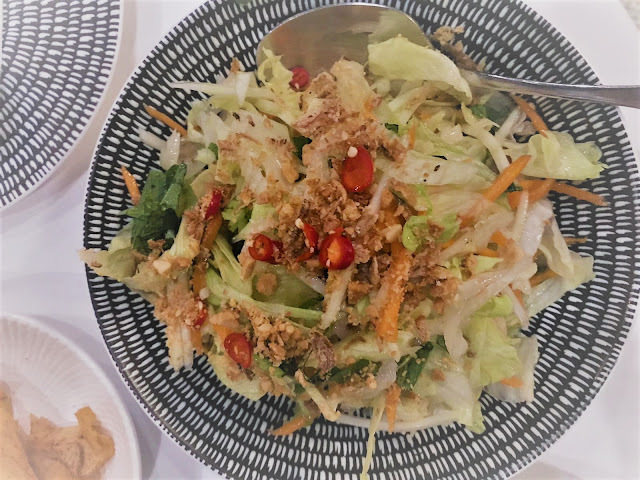 Of course the Vietnamese/French combination is almost natural (food wise, not talking politics here) and Cochin serves both classy and authentic dining in a fun atmosphere. Situated on Swan Street, in Richmond, Cochin serves many locals, but is worth travelling for too. The inside is dimly lit with a bar to one side, booth seating to one side, chairs at the front, and modern décor. It’s romantic enough for a date, relaxed enough for a business meeting (we saw both), and fun enough for a celebration (I had my birthday here this year). Foodwise, there are several vegetarian dishes. The waiter described the tomato and eggplant with tofu as an Italian Mediteraenean style dish. It was rich, with reduced tomato, caramelised onion – rich and moreish. My partner loves the Mekong Salad, absolutely delicious, he says. Iceberg lettuce and carrot are chopped with thinly sliced onion. It is served in a tangy, sweet vinegar so that it almost pickles. 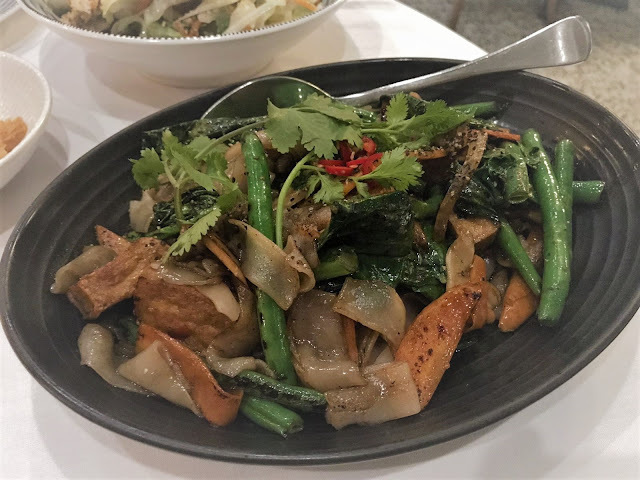 Other vegetarian dishes include spring rolls, chips with flavourful mayonnaise (these will be gobbled up quickly), greens, and beans with mushrooms and water chestnuts. The tofu stirfried noodles are a favourite. Flat rice noodles are cleanly wok cooked for that soft charred taste. Mix this with mushrooms, tofu, beans, thinly sliced carrots and you have a healthy but tasty meal complete. Even though the food is delicious, the thing that keeps drawing me back is the wine. The Minet Regis Pouilly Fume, from Loire Valley 2015, is so delicious that I crave it. It is a sauvignon blanc but tastes more like a fresh, fruity, French viogner. It holds peach and jasmine on the nose, replicated on the palate. It opens with well balanced acid and is just so fruity and delicious. I would go to this restaurant just for the wine. Unfortunately, it goes bitter with the chilli and salty food. But I enjoyed it so much before, and after, the meal. The cocktail list is equally tempting: ‘Chilli-Cam Sour’ with chilli vodka, blood orange liqueur, lemon, cranberry and egg whites. Or a ‘Viet Café Martini’ with vodka, kahlua, condensed milk and espresso. I’ve always ordered a la carte for dinner, but there are lunch specials and feed me menus during the week. In all, Cochin takes the best of both worlds; the fresh, flavoursome cuisine of Vietnam, the refinement of France.